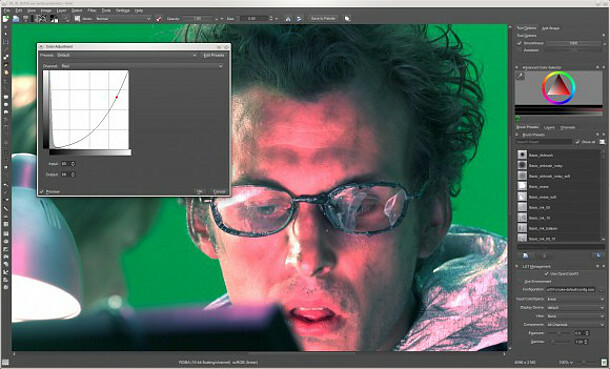 Krita 2.6 in use: a curve adjustment to a frame from the Blender Foundation’s VFX short Tears of Steel. Open-source digital paint package Krita has been updated, adding features important to high-end work. Krita 2.6 now supports the OpenColorIO colour-management system, originally developed at Sony Pictures Imageworks, and – less futuristically, but equally importantly, can now save layered PSD files. The Vc library, which enables code to take advantage of the vectorization features of modern CPUs, has also been integrated, improving performance when working on complex multi-layered documents. There are also new keyboard shortcuts and brush options, and improvements to the OpenGL canvas. Fighting talk indeed. Even if you don’t share Legrand’s views, Krita now looks like a much more powerful tool – and, with the UI themes introduced in the previous release – a slicker and more professional-looking one. Krita is packaged by many Linux distros: you can find a guide to which are considered stable and which are not on the download page of the Krita website, along with information on compiling the source code yourself. There is also a “highly experimental” Windows installer, maintained externally. No OS X version yet, alas.